From this position, the operator is monitoring the weld of a pipe, but he doesn’t have good visibility of both the super-bright region around the weld arc and its dark immediate background, which contains important process detail. The protective weld helmet this operator will wear to view the arc may provide adequate definition of the arc, but the helmet will filter out valuable background information. Even more importantly, this operator is in a relatively unsafe position. No matter the type of welding being done, manual weld monitoring exposes operators to significant health and safety risks. Looking at this photo, it’s obvious that the operator would be much safer if he was monitoring the weld remotely using weld cameras. Weld cameras have been around for years, but technological limitations hampered their effectiveness. However, recent developments in software and camera technology have made weld cameras a practical, cost-effective tool for all types of welding processes. High Dynamic Range (HDR) weld cameras—such as Xiris’s cameras—not only make it feasible to move from manual to remote monitoring, they make the move a smart, forward-thinking business decision. After all, health and safety risk results in many costs, such as lost work time, higher workman’s compensation insurance premiums, higher group medical coverage, and litigation exposure. Getting operators away from direct-observation situations naturally decreases these costs. HDR weld cameras also reduce costs by facilitating process improvements that increase operational efficiency. You can increase volume while decreasing defect rates and reducing labor. 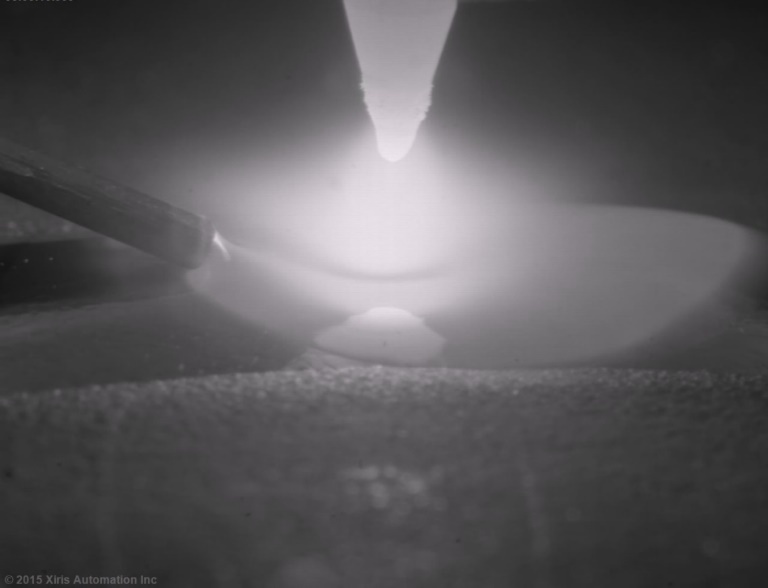 This is true for any type of welding process, but as an example, consider metal additive manufacturing (MAM), which is notorious for its challenging applications and high cost. If they have enough space, many MAM manufacturers are putting two or more cameras into a MAM chamber to provide operators with multiple views of the assembly. Using just two cameras, operators have both a leading and trailing view of the heat source and the material being fed into the melting process. And the HDR technology makes it possible to see clear detail of both the super-bright and dark aspects of this process. Without cameras, the alignment (of torch to substrate) must be checked manually, often from less-than-ideal, dangerous angles proximate to the machine, through a welding helmet or welding glass. As shown below, a Xiris HDR weld camera provides a clear view of the background material and previous passes of the additive manufacturing machine to assist the operator with clear views of the torch-to-part alignment—while not even in the same room as the weld! In this close-up view of the second pass of a titanium wire deposition process, micro-fractures can be seen in the first pass, indicating a lack of shielding gas. 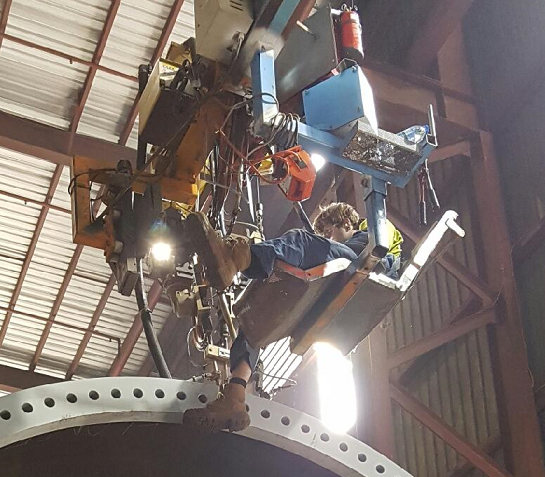 Because of the high-risk conditions proximate to the weld head, direct monitoring of weld processes is more dangerous and less productive than remote monitoring. In conjunction with other quality-control tools, HDR weld cameras can play a key role in enabling this more-efficient, more-effective remote monitoring.